As unlikely as it seems that so much time has passed, it was twelve years ago, on an ice-climbing trip in Norway, that runswithaxes was coined. I forget why I was running. Wearing sallopettes, big mountaineering boots, harness, down jacket et al, it was not running as runners know it. I think we had just finished a route, a long stint belaying in -15c leaving me cold to the bone. Perhaps I was trying to warm up. But still holding an axe in each hand, running, arms flailing as I ploughed through the snow, Karl felt the name fitting.It seemed apt enough. None of which has anything much to do with this run out of Borrowdale, taking in Base Brown, Green and Great Gable and Kirkfell before returning via Brandreth, Grey Knotts and Dale Head. Except that once again I was running with axes. Well, one at least. Not that I needed it in the end. 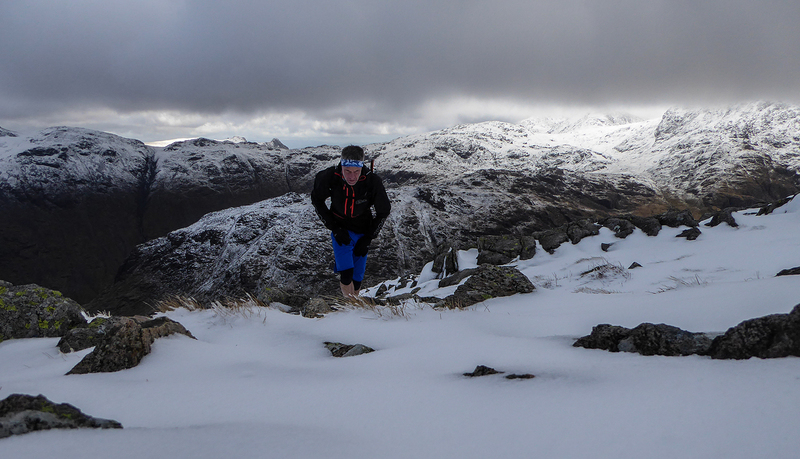 Though the temperatures were much the same as they had been that day in Norway, the wind chill on Gable close to -20c. ...and was soon above the snow line. 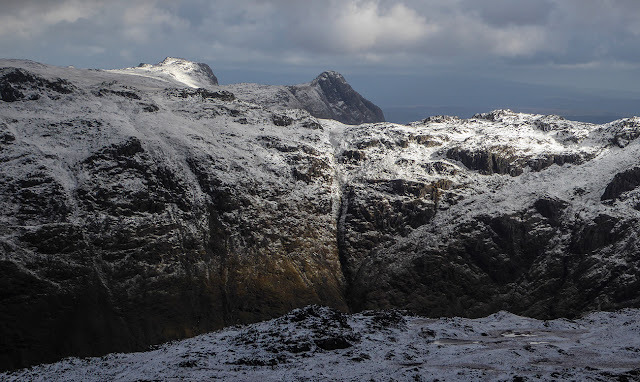 Looking across to the Langdale Pikes from Base Brown. 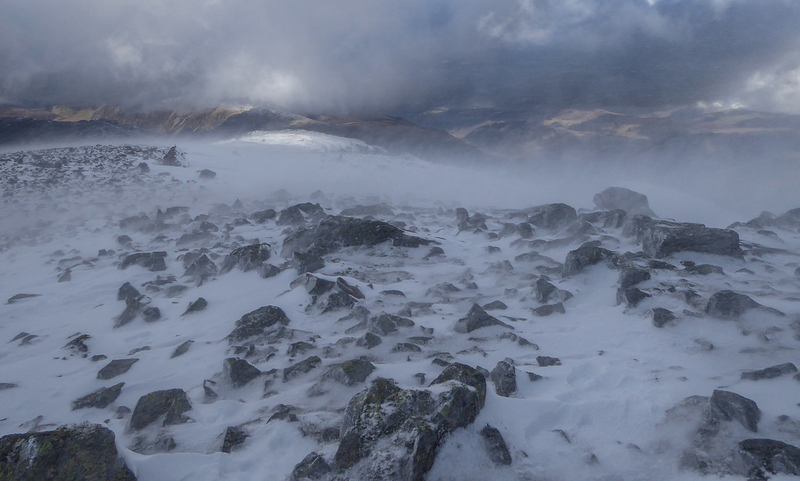 On the top of Gable conditions were fierce, intermittent white-out and spindrift blasting across the tops. I watched for a short while, enjoying the wild drama playing out around me before dropping rapidly to the col and climbing again over Kirkfell. 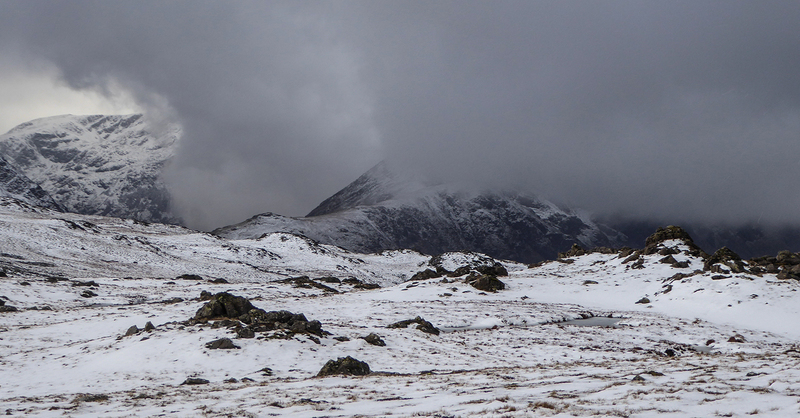 Conditions deteriorated again on the way back, hail and snow showers merging as I plodded back towards Windy Gap. A brief respite but more weather on the way - moments later I was hit by fierce winds and painful hail though it eased as I dropped to Honister. Dale Head passed in a blur and I slithered down to the valley floor to finish a brilliant day out of Borrowdale. A route that I have been waiting to ride for some time, frustrated by high winds last autumn and deep snow that persisted well into summer, things finally came together for a fantastic day high in the Cairngorm. 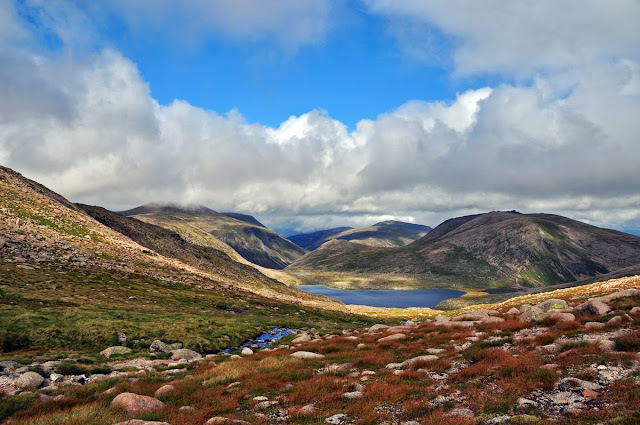 The 35km route starting from the Linn of Dee, to summit of Ben Macdui, 1309m, gives 936m of ascent and descent, but the relatively gentle gradient throughout - with a couple of exceptions, most notably the climb / carry from, and brilliant descent to, the Hutchinson Memorial Hut - means the vast majority is ride-able. A short stretch on fire roads soon gives way to the beautiful tracks beyond Derry Lodge - I rode on the west side of the river on the way up, and on the east on the way back which gives a fast flowing finale to the route. ...and the start of the steeper section, though the track remains good and the angle easy enough until the hut is reached. It is a rare occurrence that I find myself in the company of another photographer, beyond the day job at least, which is probably elevating myself rather more than is deserved, but still, it has been inspirational to spend a little time recently with someone who is not only a talented photographer but who has been bold enough to do things their own way and put their own stamp upon landscape photography. 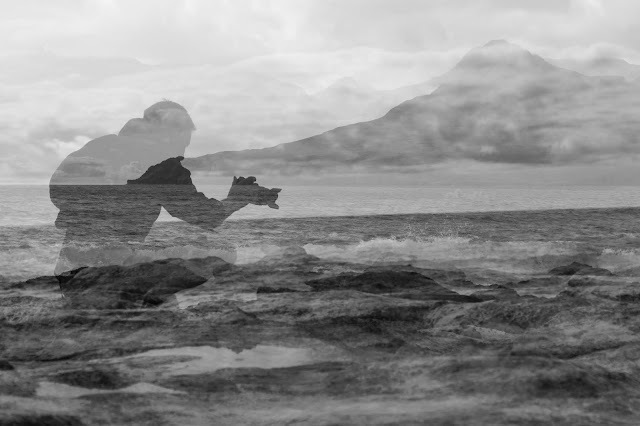 Forget remote shutter release buttons, tripods and all the paraphernalia that accompanies so many - a trait which is far from peculiar to photography of course - and think instead of someone spending long days immersed in the landscape they are seeking not to capture, but to interpret and to convey what they feel, more so than what they see. I have watched more than my share of beautiful sunsets while camped on some of the most beautiful beaches, more often than not on the west coast of Scotland or on the Atlantic coast of its islands. The east coast of Yorkshire just doesn't have quite the same ring to it. 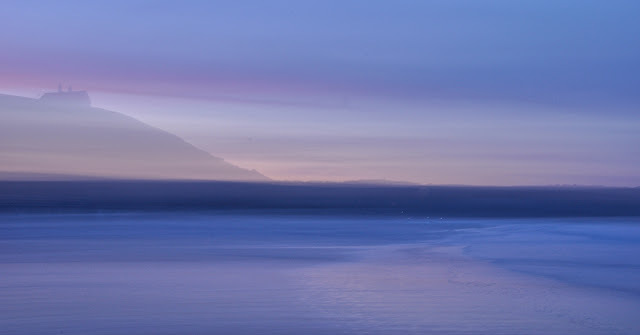 But on a stretch of beach that runs from the north-west to the south-east, in the winter months particularly, the skies regularly turn through the most beautiful pastel shades as the last of the light fades. After a long run on the moors, I wandered slowly on the beach, absorbing the colours and the call of the gulls, watching the sun set, if not in the east, then as close to it as can be. A few images then - ICMs (Intentional Camera Movement) - panning with a long exposure, from the beach. This one from beneath Westcliff, Whitby. And looking north, towards Sandsend and Kettleness.